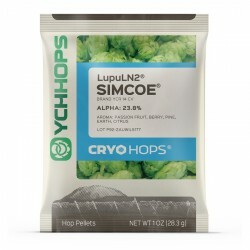 Pellet Hops / hops / Stubby's Texas Brewing Inc.
Coming in small pouches and large sacks of wonderful flavors and aromas, pellet hops are whole cone hops that were processed and extruded as pellets. Each with a balanced ratio of alpha acids per pellet. With over 60 types of pellet hops in stock from all across the world, TBI has you covered! US Amarillo Hop Pellets - 1 lb. German Hallertau Hop Pellets - 1 lb. German Merkur Hop Pellets - 1 lb. FR Strisselspalt Hop Pellets - 1 lb. German Hersbrucker Hop Pellets - 1 lb. German Hueller Hop Pellets - 1 lb. German Tradition Hop Pellets - 1 lb. German Spalter Select Hop Pellets - 1 lb. German Spalt Hop Pellets - 1 lb. German Saphir Hop Pellets - 1 lb. German Polaris Hop Pellets - 1 lb. German Nugget Hop Pellets - 1 lb.